Some days I wonder if I was really cut out to be a wife, or even an adult for that matter. I sit here and I see the obstacles of life, the waves of uncertainty, fear, doubt trying to crash of the rocky surface of my scarred heart. I crave the simplicity of 20 years ago.. when my greatest question in life was which skirt will flounce the most in the light spring breeze as I bounce around on our trampoline? Because to me, that was how I spent my worries... focusing on the flounciest skirt I had and bouncing around to the tune of giggles with my girlfriends and imaginary stares from our school crushes as we felt pretty parading and twirling about. Smiling, I remember those days as if they were another life. Funny how all my adolescence growing up seemed the answer to all my problems. And now as an adult, being a child seems like the answer to all my problems. It's not that I have problems persay, i just have waves that threaten to crash hard against the rocks, picking you up off your feet and dragging you to the depths of the sea. Yea, not problems, just waves. But the waves are real; they're life. Things like am I really the best wife I can be? All I see in evaluation of that question are my shortcomings. The way I forget to do the laundry; like ever. The way I never know how or what to cook because it paralyzes me to pick something my husband will enjoy. Although he will truly eat anything, my irrational fear prevents me from making any decisions. The way life gets hard, and all I want to do is buy a plane ticket on the first trip home and just hide form life's "hard". The way I can't remember where anything is and I often get so engulfed in work, I forget to actually SERVE my husband. The waves of how "wife-ing" should look and I see my stick-drawn figurine a far cry from what it should look like. Those waves threaten to overwhelm me some days. I hear ways I fall short. I see threats of fear, of self-doubt and I wonder... can I really do this? Can I really be a good wife that my husband deserves? Can I really be an adult? Not because of our endless list of a resume that outlines how good we can broil pork chops or how many followers we have on IG. Not because of the body you have kept or have let go of since becoming an adult. Not because of how many times you out-serve your husband or he outserves you. Not because you're GOOD. ENOUGH. But because somewhere deep down inside of you is the little girl who believed in the beauty of the day, the simplicity of the hour and the joy of simply twirling. That girl is still you. 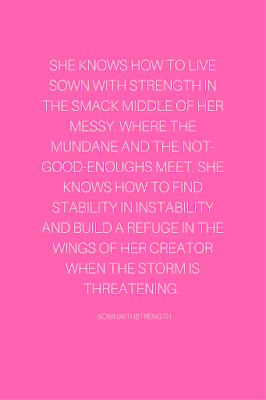 And she is capable, strong, confident, ALIVE and ready to handle the waves crashing on her the surface of her heart because she's been SOWN with the Strength it requires to withstand the storms of God's story for her. 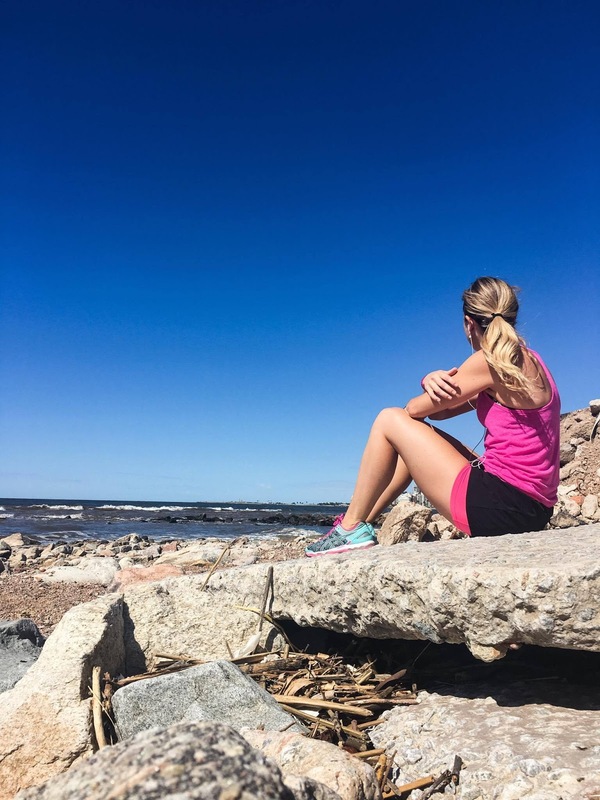 Over the years, her fears and doubts and uncertainty have become her messy, but she knows how to live sown with strength in the smack middle of it all. Where the mundane and the not-good-enoughs meet and camp out. 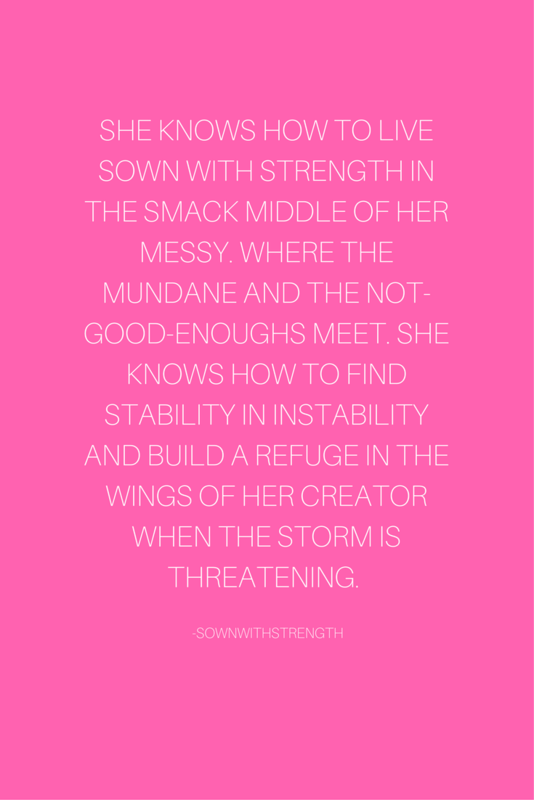 She knows how to find stability in instability and build a refuge in the wings of Her Creator when the storm is threatening. She may wish for younger, easier days because they hold a certain sunshine about them... but her heart knows the depth and value of days like today. They cause her to stand with arms high and heart abandoned in awe of the One who Gave it All. She has seen water turned from the dry desert so today, she stands firm. Knowing that it's a CHIOCE to see beauty, joy and delight in each day. You don't have to be or feel strong enough for what you're facing. You just have to be willing to call on the Name of the Lord, Abba Father and walk in confidence that the right light will light up at the right time making each footstep sure and safe. a lot of people have these questions and i am not saying that yours are important. only you seem to know the conflicts that you go through. but i think you are absolutely amazing and you can take on anything. just dont give. alone, the internet can also come in very handy.